A research team at University of Florida Health has been approved for a $15.48 million research funding award by the Patient-Centered Outcomes Research Institute, or PCORI, to study the effectiveness of three medications used to treat hepatitis C.
The five-year, randomized clinical trial will be led at UF by David R. Nelson, M.D., director of the UF Clinical and Translational Science Institute and a professor of medicine in the College of Medicine. Other lead sites for the study include the Johns Hopkins University, the University of North Carolina and the University of Michigan. The trial’s main goal will be to compare the recently approved oral medications to determine if one of them is more effective at curing hepatitis C, Nelson said. Researchers also hope to learn more about the drugs’ side effects and whether they work equally well in real-world conditions when used by a diverse group of patients that includes minorities and people with other medical conditions. Such independent studies are crucial because pharmaceuticals are typically brought to market without being compared with other, similar drugs for effectiveness, Nelson said. PCORI sought research proposals because the hepatitis C oral medications were only tested in carefully selected patient populations, leaving patients with no comparative evidence about the drugs’ effectiveness. “There is not a single study in the world right now that has compared any of these all-oral therapies against each other. These drugs are already in use, so we want to understand their safety and effectiveness and how they’re working in diverse populations,” Nelson said. The blood-borne hepatitis C virus causes a liver infection that affects more than 2.5 million people in the United States, according to the Centers for Disease Control and Prevention. Many people with chronic hepatitis C are undiagnosed and do not develop symptoms, but about one-third will eventually develop liver disease if the condition remains untreated. The PCORI-funded study will compare Gilead Sciences’ Harvoni, the Viekira Pak produced by AbbVie and a forthcoming combination tablet from Merck & Co. About 3,750 patients at approximately 36 sites nationwide will be randomly assigned one of the medications. At least 100 of those patients will be enrolled through UF, Nelson said. About $6 million of the PCORI funding will be used at UF. 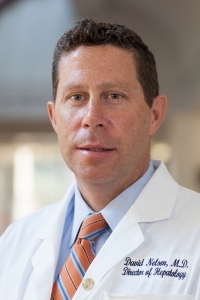 The landmark study puts UF Health at the center of groundbreaking work that will give physicians and patients crucial information about hepatitis C medications, said David S. Guzick, M.D., Ph.D., senior vice president for health affairs at UF and president of UF Health. “This important research led by an internationally recognized hepatitis C expert from UF Health will provide important details about the effectiveness of these medications, especially among groups that may be underrepresented in initial clinical trials. Dr. Nelson’s work to secure the funding for this study is yet another example of UF Health’s commitment to translational research that will benefit people around the world,” Guzick said. There’s another important reason for studying which drug works best, Nelson said. Right now, patients and physicians usually have no choice about which drug is used to treat hepatitis C. Finding out if one drug is more effective could change that scenario. “When I see a patient, 90 percent of the time I do not have a choice about which drug to prescribe. The patient’s prescription-drug payer has already decided for them based purely on price. That’s why a study like this has to happen,” Nelson said. UF Health is an ideal choice as a coordinating center for the study due to Nelson’s expertise and because UF is one of two universities already leading an international consortium that is transforming hepatitis C treatment and research, said Thomas A. Pearson, M.D., Ph.D., UF Health executive vice president for research and education. Person said a major benefit of the study will be learning more about which hepatitis C drug works best among various subgroups of patients, such as minorities and those with diabetes. During the trial, UF Health will coordinate many of the study’s logistical and clinical aspects while researchers at the University of North Carolina at Chapel Hill will be responsible for data analysis. Researchers at Johns Hopkins and the University of Michigan will contribute specialized scientific expertise, Nelson said. UF and the University of North Carolina’s leadership roles in HCV-TARGET, the hepatitis research consortium, likely played a significant role in landing the PCORI-funded study, he added. HCV-Target is a registry of patients that includes more than 45 sites nationwide and a partnership with the U.S. Food and Drug Administration. “It allowed us to develop an inexpensive model for collecting meticulous clinical data. The essence of this is UF and the University of North Carolina capitalizing on developing some really innovative infrastructure and methodologies to enable a big study like this,” Nelson said. Nelson’s award has been approved pending completion of a business and programmatic review by PCORI staff and issuance of a formal contract award.